Cooking never came easy to me, geese, I would be lying if I said it was a walk in the park even up to this day! Cooking can be fun, and would be SO MUCH FUN if we had one of those awesome kitchen with unlimited supplies (you know the stuff at the grocery store thats $28, you don’t know how to pronounce it, and you are probably only going to use it for that ONE recipe..??) fancy appliances, and all that other fun stuff! Well back to reality, we have a kitchen you can barely turn around in without running into the fridge or dishwasher! We manage and still eat, so Yay for us! I found this recipe a few different places, but I decided to do it my way and don’t follow what they do anyways! Basically just most of the ingredients are the same. This was a two thumbs up from the fiancé and myself! 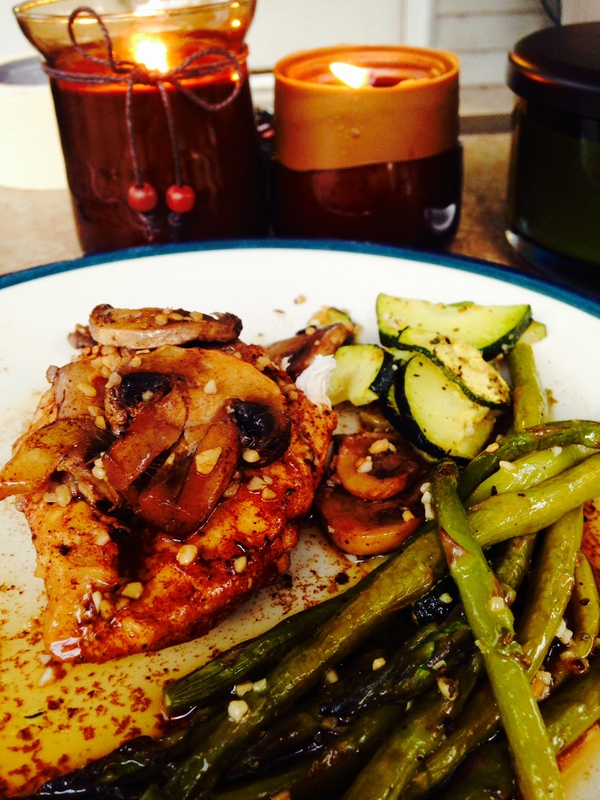 Balsamic Chicken Breasts with the Greens! This was soooo yummy and very easy to make!! it was only in the oven for about 40-45 mins and everything was PERFECT! It could feed probably 2 normal people! (I make a half recipe with only two chicken breasts) haha We don’t eat much so it was fine for us, and a third person that probably ate than and then made more to eat 😡 hahah!! Directions: This is so simple, are you ready!? >Preheat oven to 400 degrees F.
>Get out two glass pans, I had a square one I used for the chicken and rectangle I used for the veggies. >Put about a table spoon of Extra Virgin Olive Oil in the bottom of each pan. and Place chicken in, roll both sides in EVOO. Then do the same with the asparagus and the zucchini. 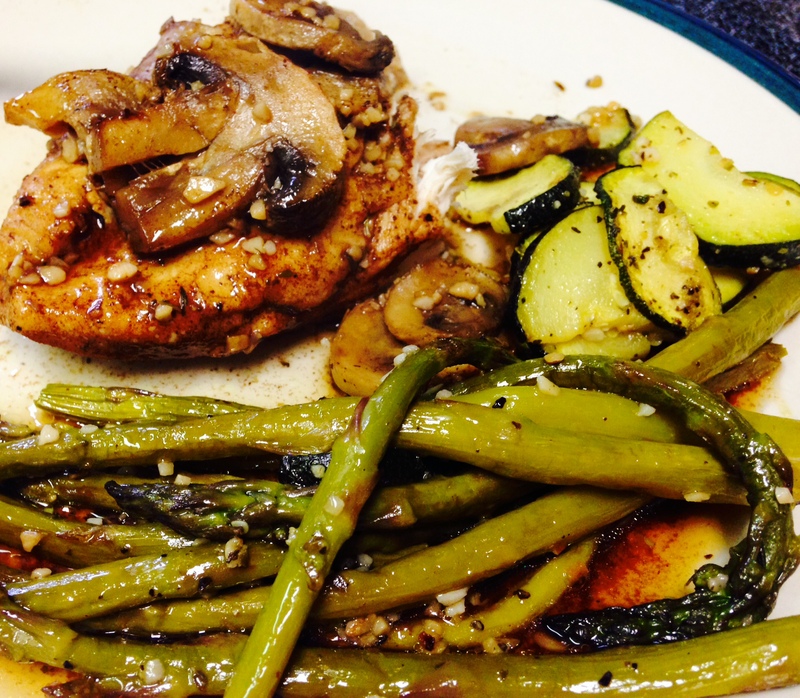 > Use salt and pepper and sprinkle on both sides of the chicken, plus add some to the veggies for taste! > Here is where you add the garlic!!! I loooove garlic so I loaded it on, both the veggies and the chicken. > add package of button mushrooms to the chicken. 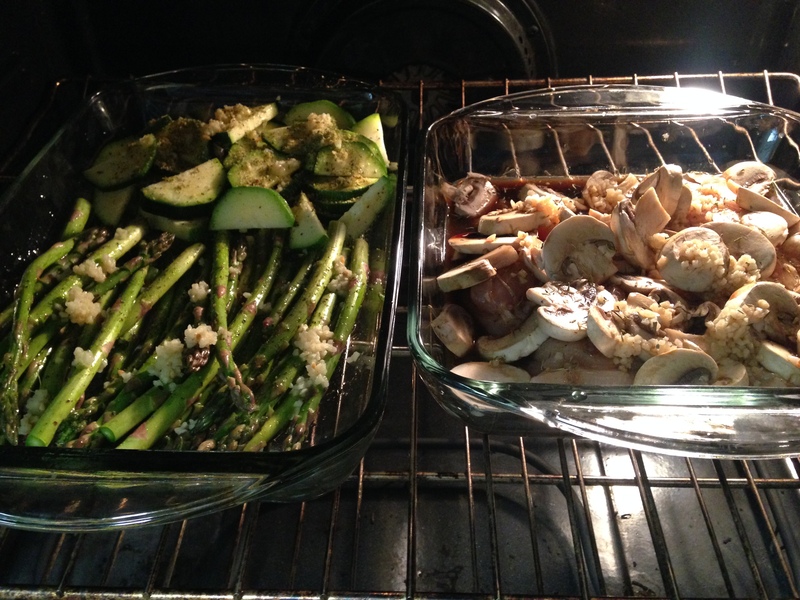 > I found some roasted garlic and cheese seasoning hiding in the cabinet, so I sprinkled that on the zucchini to give it a little difference in flavor from the asparagus.– now vegetables are done and ready to go when you are! > Time to finish off the chicken. 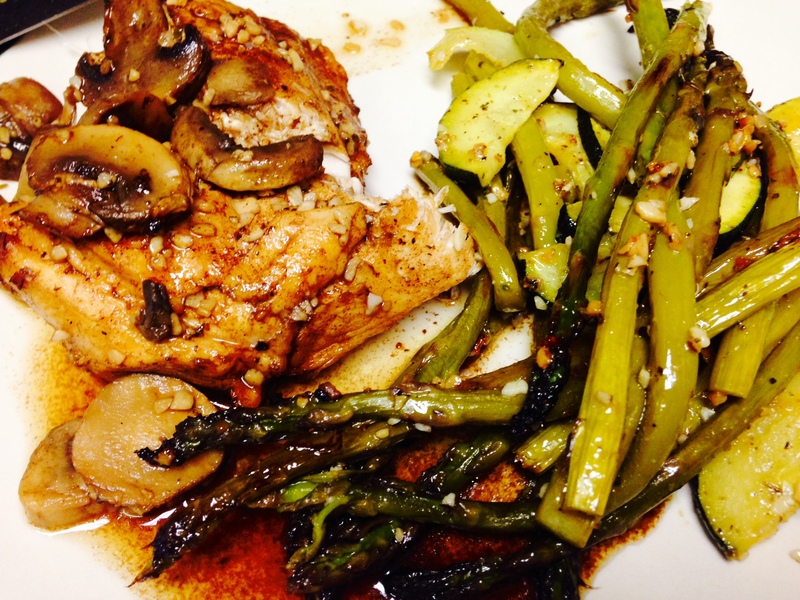 add your balsamic vinegar, low-sodium chicken broth, dried thyme, and bay leaf to the chicken. I broke the bay leaf in half and put one on each side of the chicken ends to spread the flavor! >Bake until chicken is fully cooked and vegetable are done to your perfection, about 40-50 minutes!! Make sure you check every few minutes to flip the chicken, drizzle some juices on top of it, and roll the vegetables around! There you have a fairly cheap, yet delicious healthy meal!! We will be making this again and again!! Plus, if you don’t like mushrooms, this is the opportunity to try it again. I am not a huge fan, but myyy ohhh myy were they AMAZING!!! We even enjoyed it out on the porch with some candle light and a nice glass of red wine!